One of the most cutting-edge members of the Bundesliga on social media, high-flying Hertha Berlin are the top-flight's first club with head coach and sporting director on Twitter. Both Pal Dardai and Michael Preetz have begun using the medium - and with it the club's official hashtag #hahohe - far more frequently in recent months, while in January Hertha also brought on board Twitter's former head of sport in Germany, Michael Keuter, to be responsible for their digital development. Dardai: "With Deutsche Bahn en route to Hamburg and just had a look in the ICE cabin - cool view! Preetz: "Dear Dortmund, we were going to change the pitch, but now we'll leave it until you come..."
After being drawn against Borussia Dortmund in the DFB Cup semi-final, Preetz sent this tweet. BVB had previously complained about the grass at the Olympiastadion. 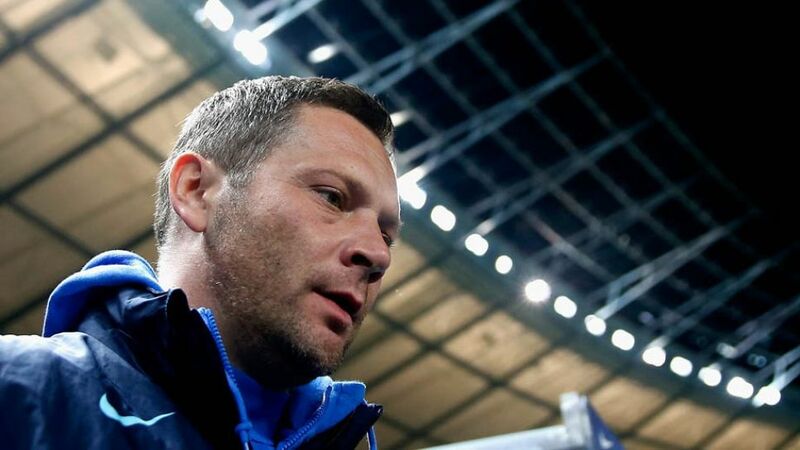 Dardai: "Cheers to a home game!" After being drawn to play Dortmund in the DFB Cup semi-finals. Preetz: "Welcome to the Hertha Berlin family, Sinan Kurt. We're really pleased you're here." Announcing the signing of Sinan Kurt from FC Bayern München. Dardai: "From one colleague to another: all the best and come back soon and - most importantly - healthy, Sascha Lewandowski. We're thinking of you!" After Sascha Lewandowski, the head coach of city rivals 1. FC Union Berlin, was forced to step down due to illness. Preetz: "Signed! John Brooks is staying at Hertha until 2019!" Announcing John Anthony Brooks' contract extension until 2019. Dardai: "I'm looking forward to my first visit to the ZDF sport studio - a perfect time for my first tweet." The Hungarian coach's first tweet. Official club account: "Is Mourinho a new Hertha fan or just jumping onto the bandwagon? Either way, we're glad you came." Hertha to Dortmund: "It's great you're giving it everything in training. Have another session now so that you're still recovering on Saturday at 15:30..."
Dortmund to Hertha: "Are you not going to be playing?" Dortmund to Hertha: "Do you still watch black-and-white films sometimes?"